By definition, stainless steel is a durable steel and chromium alloy that is practically immune to rust, discoloration and corrosion. It differs from carbon steel by the amount of chromium present in its composition. Stainless Steel is a common name for metal alloys that consist of 10.5% or more Chromium (Cr) and more than 50% Iron (Fe). A continuous film of chromium oxide on the surface of the metal makes the material "stainless". Stainless steel alloys have remarkable versatility based on the alloying additions to the material. 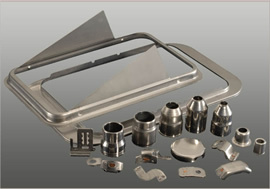 As a contract metal stamping manufacturer, Winzeler Stamping Company produces a variety of precision stainless steel products for applications in the automotive, diesel engine, and medical industries among others. We specialize in stamping the austenitic types of stainless steel, especially the workhorse 304 series. Our capabilities extend to blanking, piercing, forming and drawing of stainless steel components with repeatable accuracy and precision. With transfer and progressive die presses, we have the ability to produce products which range in size from very small precision parts with tight tolerances to large, heavy gauge pieces. We purchase our stainless steel only from reputable suppliers and we adhere to strict quality guidelines throughout our manufacturing process. Our in-house engineering team, tool design & build team, and experienced machinists are dedicated to providing you with streamlined expert service from concept through production. 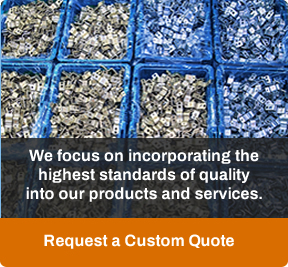 Contact Us to talk about the requirements for the part you need to source, or allow us to quote your part now. We are certain you will find us to be trusted and reliable value-add partner.